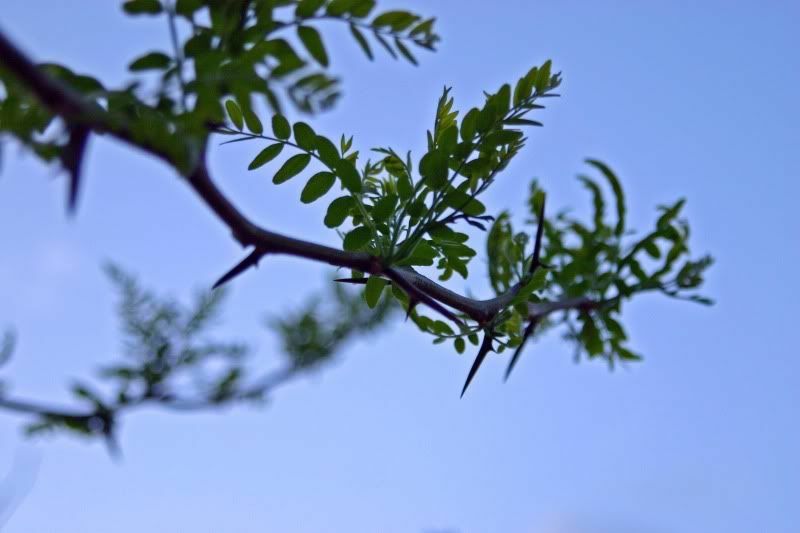 I love that my brain is trained to think of Jesus every time I see thorns. To me, thorns are a reminder of what He suffered. And that I really don't have it all that bad, even though I whine a lot. They're a subtle but strong reminder to keep my head in check. How awful to imagine those thorns pressed into one's head. We can't begin to imagine the pain He endured, and the price He paid to save us. All I can say is Thank You, Lord. One year, a friend and I made a crown of thorns for the Good Friday service at our church and set it on the Baptismal font on top of a pretty cloth, up on the altar. During the service which is always in the mid-afternoon, sun beams came through the windows, and rested right on the crown of thorns for quite awhile. Still makes me cry. Great post girl. The thorns are such a huge representation of Christ's death and resurrection, aren't they? Great job! it's great that you see something wonderful in what could be construed as something to be avoided. I love your fingerprint friday post this week! Definately a fingerprint of God! It will remind me to think of Jesus and his sacrifices everytime I see a thorned tree! Wow, what a great reminded. Simple, yet LOTS of meaning! Thanks for the great reminder! Even though we think that our life is rough sometimes, I can't even begin to imagine what Jesus went through for us. What a simple reminder. Thanks for sharing today! Hope you have a great weekend!! Love your post. Thorns are so painful and yet they were only a tiny part of the suffering He willingly bore for us. Great reminder...thanks! Thanks for the reminder today Beki. I didn't even see the thorns until I read your post. It's hard to think about the pain and suffering that our Savior went through for us, but it is necessary to realize the great gift we have been given. Hi. I really like your post! This is a wonderful idea!! For me, the thorns represent that we all must go through pain before we see the glory. My thoughts exactly. Each time I cut roses and get cut, I remind myself that is nothing in comparison to what HE has done for us. Thanks for sharing this wonderful photo and post today. I'm new to your blog...but I wrote a post on my blog too. Hope you will check it out. I love your blog by the way!